Posted January 14, 2019 by Sarah Lederle & filed under . Tim Thiessen and his fiancée Natalie Hess are a prime example of what the popular Eukanuba 8-Dog Classic has done to educate and groom up-and-coming mushers to the Pedigree Stage Stop Race main event, with not only the experience the race itself brings but also being in the company of so many true professionals that will give suggestions and help in any way. Along with the vast knowledge from the veterinary crew, it is truly an education that would take several seasons or more of going to two-day races all wrapped up into this one event. Quite frankly you could go a whole career of weekend races and never receive the expert advice and attention that you gain here at the Pedigree Stage Stop Race. We are glad they decided to step up and join the fun! The following is an interview with Tim’s fiance’ and handler Natalie. Where are you now? Have you begun your trek to Wyoming? Do you arrive early to acclimate to elevation? If so, where are you training? We live and train at our home in Leadville, CO. Our elevation at the cabin is 10,890′ so we don’t really need to acclimate the dogs to the Wyoming environment at all! We will begin our drive to Jackson a few days before the race start on Friday. It will be about a 500-mile drive for us to arrive in Jackson. We have had a fairly average winter regarding our snow pack. We did luck out and have some early season snows which helped in setting the training loop, allowing Tim to get on the runners earlier than he has in years past. When do teams start their training? Is there a target for number of miles to have? What distances do they train once their team is fully conditioned? What is their training schedule like 2 weeks before the race? 1 week before the race? We began training in September when the weather finally cooled off enough to run dogs. While Tim has had a mileage goal set for months, it is really up to the dogs and how they are progressing. We will still be running our normal training schedule this week, and then they will have a rest week before the race start. How do you see this years changes in mileages and number of dogs affecting your training and the possible outcomes? 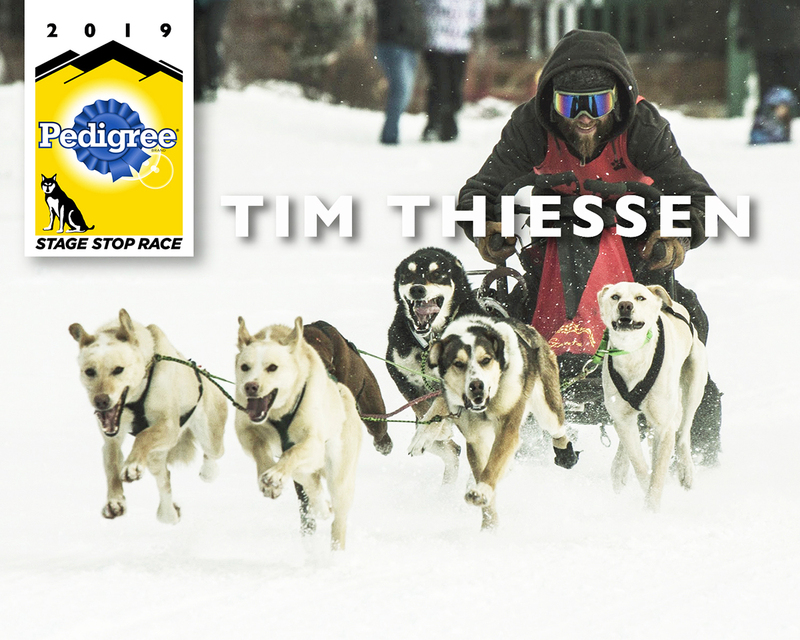 As this being Tim’s rookie year at the Stage Race, the changes in mileage and dogs were the main decision in deciding to enter. Previously it would have been quite difficult to train at home and get the mileage necessary to run in past races. Also, as it is just Tim and I maintaining our kennel we have a set number of dogs that we can reasonably care for. By lowering the number of dogs we could actually consider participating based on our personal kennel limitations. What made you decide to compete at the Stage Stop? When Tim made the decision to enter the 8-Dog Classic last year, we didn’t know what to expect when we arrived. It ended up being a completely life, and kennel changing, experience. Austin Forney contacted us to alert us to the changes in mileage and dog requirements, and when Tim realized that the Stage Race was more of a possibility than it had been in years past, he made the snap decision to enter and “see what happens”. One thing that we have both realized as a result of his decision is that our kennel is in the best shape, physically and mentally, than it has ever been in the past. We have both stepped up our levels of dog care, and it truly shows. Personally, I am so proud of the amount of time and work that Tim has devoted to training for this event in his, and our kids, lives. It is terrifying and exciting to see the caliber of competition that this race will bring to the table. As the official team Mom, I am so proud to load our dogs and allow them to experience this honor of competing with Tim as their driver. Welcome to the family, Tim and Natalie!